Bonn, 22 May 2015 - Today is the anniversary of the adoption of the Biodiversity Convention (CBD), an occasion now designated by the United Nations as the International Day for Biological Diversity. It is a time when the global community of international biodiversity-related treaties can highlight the spirit of cooperation and solidarity that exists among them. Each has its own specific niche – CITES dealing with international trade in animals and plants, Ramsar with wetlands and CMS, safeguarding migratory species of the air, land and sea and their habitats – but all combine their efforts to the common cause of securing a future for biodiversity, aligning their strategies to achieve the Aichi Targets and contribute to meeting the Sustainable Development Goals. All too often CMS has to highlight bad news - just see the recent developments regarding Saiga antelopes. Migratory animals are exposed to anthropogenic dangers, such as the loss, degradation and fragmentation of natural habitats, barriers to their movement, poisoning (both deliberate and incidental) and overexploitation. These are factors causing many species’ populations to decline and, in some cases, collapse, casting real doubts on whether they will survive at all. By way of example, this year’s World Migratory Bird Day (9-10 May) emphasized the threat posed by energy installations to wild birds and the need to plan, construct and design energy infrastructure appropriately. 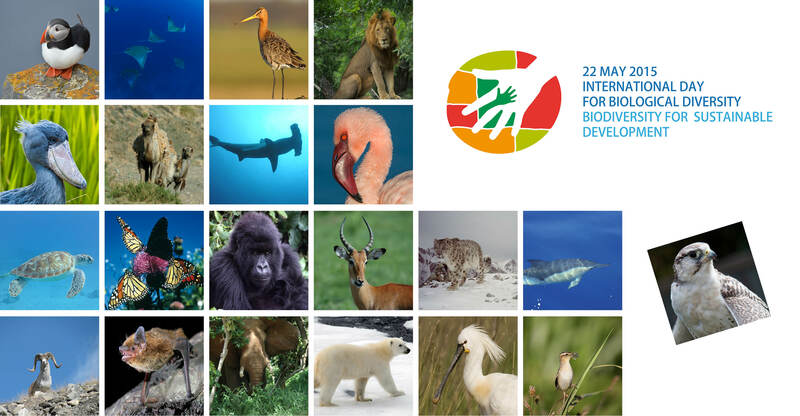 But this year’s International Day for Biological Diversity and its theme - Biodiversity for Sustainable Development - presents the opportunity of looking at the relationship between wildlife and its conservation on one hand and human activities and aspirations on the other from a more positive perspective. We can also emphasize the great contribution that migratory animals make to people’s livelihoods and culture. Many migratory species perform vital ecosystem services. For instance, Sharks and dolphins are top predators in the marine sphere and act as regulators, enhancing productivity and biodiversity. Vultures serve as nature’s waste disposal units consuming animal carcasses thereby helping to safeguard human health. From pollination services to provision of food and income – migratory species can make an important contribution to local economies and livelihoods. The economic benefits from bats alone, for example, include biological pest control, plant pollination, seed dispersal, guano mining, medicinal applications, education and research. Argali sheep and other migratory ungulates which can be sustainably harvested can also provide an important source of income through hunting, when this is well-managed and follows the provisions of both CITES and CMS. Hunting for a single Argali sheep trophy can for example provide US$5,000–20,000, with specific sites in China being able to derive US$60,000 in argali trophy hunting revenue. The challenge to reinvest this income into local communities and conservation does, however, remain a serious one, which CMS policy tools such as the Central Asian Mammals Initiative aim to address. Tourism is an important source of much needed foreign currency in many countries - particularly developing ones – and wildlife is often one of the main attractions, ranging from safaris in the National Parks of Africa and visiting bat roosts to whale watching and diving with manta rays. By drawing in visitors, a single manta ray can help generate thousands of dollars of tourism revenue over its lifetime; dead, its carcass might reach at best a few hundred dollars at the dockside market. The figures really are staggering - whale watching globally is worth US$2 billion a year – shark diving is worth US$42 million in Fiji, US$18 million in Palau and US$38.6 million in the Maldives. The rewards are not confined to exotic island holiday destinations either; developed countries can also derive huge benefits. The US Fish and Wildlife Service estimates that bird-watchers generate turnover of US$32 billion for the American economy in equipment sales and hotel stays per year. Unfortunately, it is uncertain how much longer charismatic animals such as the elephant can contribute to countries’ economies as there are also huge profits to be made from wildlife crime, an illicit industry that ranks alongside the narcotics trade and human trafficking in terms of volume. It also has the added disadvantage that the proceeds help finance war and civil strife. While determined public education programmes are having some effect in reducing demand for ivory and bushmeat, it is doubtful whether the unscrupulous warlords will be swayed by rational argument to stop slaughtering elephants. It is the purpose of the Convention on the Conservation of Migratory Species of Wild Animals and the Agreements and instruments concluded under its aegis to provide a forum where their Parties and Signatories can work together to ensure the survival of a shared element of the world’s natural heritage. What sets migratory species apart from other components of biodiversity is that they are a common resource, whose survival depends on all range states collaborating. The recognition that failure to manage these animals – including the often fragile habitats upon which they depend - in just one part of their range can have far-reaching effects elsewhere along the animal’s migration route, even thousands of miles away on a different continent or on the other side of the ocean. By working together to ensure the sustainable management of migratory species, CMS Parties can ensure that these animals – mammals, birds, fish, reptiles and even insects – can contribute to sustainable human development, fulfilling the Convention’s role as the principal partner to CBD on issues relating to migratory species. Sustainability and Tourism - How Can They Fit together?